Have you ever heard the story of the baby eagle that fell from it’s nest only to land in a family of turkeys? He grew up thinking he was a turkey. He ate with the turkeys. He slept with the turkeys. He even acted like a turkey. But he knew in his heart that he wasn’t a turkey. And one day he looked up to see an eagle soaring majestically in the afternoon sky. At that moment he knew that he was an eagle. When it comes to websites that want to sell you something, there are turkeys and there are eagles. If you want to save the time and heartbreak of wasting both time and money, it will be important to be able to spot the eagles, and avoid the turkeys. Ah, my personal pet peeve. The Internet is littered with sales letters written by people who have only sold their “how to” book or audio or membership. I see sales letters all the time claiming to help you earn big bucks when in fact the person who put up the site has not earned much of anything. They haven’t done what they ‘teach’. They just sell information. They read books, buy courses, visit forums, ask questions, and restate what people tell them. Sure, they know how to sound slick, but they have not experienced operating and succeeding in an online business themselves. If you are considering buying a product, look first to see that the person behind the product is walking the walk, not just talking the talk. Today we are seeing more and more “one time offers” than ever before. These pages begin with “You will only see this page once!” and then go on to make some outrageous offer where you get a million dollars worth of stuff for about 15 cents. Another common tactic is the “special offer” that sells for only $37 but then traps you in what I call “upsell jail” where you are made to feel like a fool if you don’t buy the upsell. Why is such incredible pressure necessary? It’s not necessary, but it works. And because it works more and more sites are using it, and more and more consumers are getting hurt. After all, how many of these offers have you bought and never used? Here’s one example: They send you something “free” that is valued at over a hundred bucks. But when you click the link and get to the page you discover that you have to buy something to get the freebie. When did free stop being free and start becoming a discount instead? If they want to offer a discount they should say that. If they say the word free then what you get should not be conditioned on spending money unless they have been clear about that up front. And who in the world invented the phrase “ethical bribe”? That’s like saying “honest criminal” or “diet cheesecake”. Find someone who will share openly (and specifically) how you can get your share of the success you want and deserve before you give them your money. Find something that sounds right, that makes sense to you … that you understand. It’s easy to spot the real people when you know what to look for. The people you can trust will usually have either a very deep level of knowledge about one subject or solid knowledge on various topics. The knowledge and experience a person has will usually express itself in the form of information products, articles, information on a website, or a combination of these things. If you look, you should be able to find other products or (preferably) free articles or an ezine you can read to get a sense of who the person is before parting with your money. When you sell information for a living it is often difficult to find the balance between how much to give away and what to sell. That’s natural and to be expected. It’s unfair to expect people who sell information to give away everything they know free. But if the answer you get to every question you ask is “buy my product” then be very careful about doing business with that person. People who are really succeeding online should be making enough money that they don’t require that every phone call or email results in a sale. If you can’t reach someone by phone or email with a question, then watch out. This is not to say that everyone out there will answer their own phone. People are busy. But there is a growing trend among websites to not answer pre-sale or non-customer questions at all, and that must stop. After all, you will be paying your hard-earned money, and they can’t take 2 minutes to answer your question? I don’t think so. Would you buy a suit or dress from a store that refuses to let you try it on first? The level of access you get to a person before a sale happens is often an indicator of the type of support you will receive after the sale. Great websites lift you up and help you see the possibilities without resorting to hype. They encourage you that you can learn what you need to know and accomplish your goals. They speak (as much as a website can) about you and your goals, not how wonderful they are and how much you should want to be like them. There is a fine line here that can be discerned very easily. Does the site make you feel good – feel like there are possibilities for you, or not? Or does it make you feel afraid of missing something if you don’t buy today? Sites and people who lift you up, give you real help before you spend money and support you after you buy are the true eagles online. If you rely on more than one factor to make your decision about the site’s credibility, you will protect yourself and avoid falling in among the turkeys. There are turkeys in the land. Eagles don’t fly with turkeys. You were born to be an eagle. When you choose who you do business with based on a combination of the things above, you will move quickly toward doing business with people who want more than just your money… they want you to succeed. What Does Your Customer Really Want? I am very happy to know you. You’re right, there is a lot of junk on the Internet today. I spent a lot of money on junk to learn this . I bought a few products from you and will be glad to buy whatever I need from you again. Charlie, I believe in what you sow you will reap. I hope to learn a lot from you. Keep on sowing the value. God bless you. Thank you Ellis! I appreciate your kind words. They come at a great time for me. You are the FIRST person to say that! Thank you for that. I’m no comedian but laughter is indeed the very best medicine. The level of access you get to a person before a sale happens is often an indicator of the type of support you will receive after the sale. How profound and true are these words! In all my experience of being online this would have to be one of the biggest pitifuls most novice marketers fall into. I know because I have fallen many times. I have been a DOE member for 4 years now Charlie and I must say your advice and ideas always hit the sweet spot with me. So thank you for your wonderful intelligent writing and common sense approach to internet marketing. I have unsubscribed many “so called gurus” from my email list however l would like to say your name will never one of them. There are trusted people in the world and then there are those you can trust. Thank you again Charlie for your amazing service. Thank you Warren. You made my day! Thanks Charlie! What I have always liked about you is that you tell it like it is! My peeve is with online marketing, affiliate marketing and network marketing / direct sales when the mantra is “it is easy … anyone could do this” only it’s not. Maybe it’s not rocket science but it is not so easy. That is why so many people leave battered and discouraged and broke. Honesty would be so much better. That’s what you’ve got! Thanks Patt! I know it can be hard but I believe anything can be done if broken down into small enough steps. That’s why I produce so many Success Checklists. Baby steps get the job done! I appreciate you taking the time to comment, and your kind words. Repurposing old content is great when it is good content so good job Charlie! Thank you very much Charly. Very inspiring reading. Just wanted to say that I enjoyed your article Charlie and value your advice even more. Since then I have squandered a great deal of money on line seeking instant success. After discovering your material I have started to make progress in building a genuine on line business . A sincere and heart felt thank you for being an eagle . Thank you Gerald. You made my day! You’re so right…wish I had this information before. I am happy you find it helpful. Great information which has so much truth within it. I guess we are lucky in Australia as we only have the Brush Turkey that only wrecks your gardens to build their nests, lol. Not quite legal but a Turkey Shoot would be handy to clear away some of the rubbish that seems to go on forever. But I suppose these other Turkeys are doing the same by building their on nests at everyone else’s expense. Ok Charlie…so what about us with no internet marketing experience, social media experience or no product to sell. Seems like the biggest selling niches out there are something I don’t have experience in. This is the exact reason I’ve been stuck for the past two years on go because I don’t feel I have the experience in any of the niches’ I want to pursue. So I talk myself out of proceeding with anything. I don’t want to push products or information I’m not experienced in or mislead anyone. Any advise? It sounds to me like the challenge might be focus. If you had focused on one thing for the past two years, and worked that method every day, you would be an expert by now. No need to worry about the past. All you can control is today. Take some time and choose your “one thing” to focus on and let that be your mission. I your article very interesting for its very realistic way of denouncing the wrong tactics of so many Internet Marketers, to whom so many have fallen preys to, and I love the spiritual message behind because yes, the eagles are able to see from afar to discern the motivation behind their methods and langage! I receive your emails and I can confirm that I discern that you are part of the eagle group, the one I belong to as well! Thanks for this article and for helping to make the truth stands in this business! Charlie – may I re-do this article to fit the non-profit that I work for and the exhibitors/vendors that I deal with? they are buying exhibit space from us for a trade show and keep saying that” such-and-such will give me “x” for free if they sign – what can i give them” i would like to post a modified version of this on our LinkedIn page. That’s fine with me as long as you keep my name as author and my resource box in tact. Always happy to share my content with attribution. I hope you find it helpful and thank you for asking. Great post Charlie. Being able to be reached by phone or email is a part of doing business online and just goes with the territory. I’ll gladly answer someone’s question if they have one and they don’t have to spend money with me either. Hi Charles, nice to see there’s someone with integrity left in the internet marketing field. There’s scams everywhere online and off. As author on a free creative writing website, I will say, I feel for our protégés trying to break in. There’s a lot of miss info to confuse the newcomer and frustrate the experienced info surfer too. Everyone can feel the opportunity that the vast and powerful net has for plenty of people to make money. I think many people confuse the internet with like being another planet where an earth dollar is worth $100 dollars. It is not some magical place, just a tool to be applied to enhance what we do offline in the real world, like the fax machine when that first was invented (only a fax machine on steroids). One still has to build a solid business platform to take advantage of the internet’s magic. Even if you plan to conduct all your business online you still must be grounded and have something of real value you are trying to sell and a real business idea you are trying to build. Just because you can do a lot of stuff for free on line doesn’t mean it’s easy or cheap to create an online business. It’s much easier to create a solid offline business and leverage the opportunities presented by all the emerging web technology to help you succeed. I hope that helps someone. Make a plan, focus and get busy claiming your virtual real estate but don’t think it is going to be easy. http://www.anewtale.com free reading and free writing help! Remember, writing is what sets us apart from all of God’s creatures. Serve writing. Do writing justice. I can’t think of a nobler profession than the creative writer. A very reworking of all old story! Time to soar 🙂 You’re work is always top notch! I’m glad you can’t see the size of my Turkey Farm, it’s embarrassing as to how easy it is to get sucked in. Glad to say that my approach has got a lot better lately, not perfect yet. Getting close. Some of these Marketers will hit you with up to a dozen sales pages a day which is totally ridiculous and that would not even let you get one or two items up and running. Other objections nowadays is there seems to be an increasing amount of webinars, sales swaps, 4 million new plug-ins, etc,. Great post which seems to have a nerve with quite a few of your readers. Thank you for this. Great article Charlie, I concur with every word. I will share this hopefully so that others will read it too. Charlie it is interesting that what you are saying has been said many times but yet, the successful internet marketers use these techniques all the time. You know the saying about suckers? There is one born every minute. However, these successful internet marketers I am referring to (and I can name them) all stick to this tried and tested method. I can’t help asking myself, do I want to also sell my soul like this? Nice article Charlie, but I have a comment. It’s hard to differentiate between baby eagles and baby turkeys. So, don’t accuse a baby eagle of being a lair if he is telling you what old turkeys taught him about flying. As long he is practicing what he is preaching, even if it was false turkey info, he is eagle. This difference between eagles and turkeys is taking action and believing that failure is the only way for success. Thanks. Great article Charlie. Thank you so much for all you do. The author of the sermon/book you mentioned in the notes, Pastor Peter Lord, is a personal friend and mentor of mine. All of his works are great. Again thank you so much for all you do. Be Blessed my friend. You are a blessed man to have him as a friend. It really is one of the best sermons I’ve ever heard. As a Amazon affiliate, in the past I have purchased several “courses” on how to make money on Amazon. I have noticed that some of the paragraphs in one course is word-for-word for a paragraph in another course. When that happens, you know you bought from a Turkey and not from a Eagle! As usual you hit the nail right on the head. It is so frustrating to know that so much of the stuff for sale has been compiled by people who don’t have the slightest clue what they are talking about. Buyer beware… do your homework and research who you are associating with, before you follow their Model. SMOOTH WRITING AS ALL WAYS. I LUV TO READ YOUR INFO. EVEN THO I HAVE NO BLOG OR WEBSITE. Oh Charlie you hit the nail on the head with this one! I always consider the money I “wasted” when I first got started on the internet as my “college education” (it cost about the same too). I would love to have read this article a bunch of years back! Keep up the good work! car accident and we had a very rough financial time for a bit… interesting how sometimes peoples circumstances sort of mirror each other, makes us realize we are not alone in lifes many trials… Thanks Charlie for for being an honest marketer and teacher with integrity… God Bless!!! Now I’m blushing! Thank you for your kind words. I look forward to working with you. What Denise says about you is spot on with what attraceted me to you Charlie. Thanks for being a straight shooter! Let us admire the eagles and flush out the turkeys and shoot ’em!!! Thank you Walter. I appreciate your kind comments. This is a great message. Too often, people try too hard to fit in with the turkeys instead of doing what it takes to soar where they truly belong. Thanks for the great article. Even being relatively new at this Internet Marketing gig, I truly understand (and have experienced) the turkeys out there. The Eagles are easy to find once you know what to look for. They are the people who understand ‘ it is better top give than to receive.’ If you give first, you will receive far,far more than you gave. Thank you Charlie.You have always been transparent in the way you air your views. And that makes one-apart from the wolves. Hi Charlie . Thank you for the sunday mail , To know exactly what internet marketing and trust what ever you read is very hard , That is why in order to become a good marketer if possible with few cheat .It really consumes a lot of time and effort , You article on this mater would help thousands and it is an alert for those who began . Thank you so much for your truly devotion for the business of yours as well as others. As always you hit the nail on the head but there is something else that needs to be said I think. Recently my partner and I have changed the look and feel of all our sales pages, etc. to compete with the turkeys. It seems straight forward honesty in a simple format is not catching the eye of the potential buyer any longer. We have had to resort to flashy graphics and sales pages that “SELL” as oppossed to the simple, straight to the point web sites we use to use where we just let the information do the selling. I do not like competing with the snake oil sales sites and would be happy to go back to my old style, if you could just tell me how to do it. Other than that I agree 1000% and as long as each of us can remember turkeys can not soar and eagles very seldom fly we will be much better off. I just thought about something else as well. Turkeys always flock together with other turkeys. Most eagles fly alone. Just my thoughts. I disagree about the straightforward look not working. I think one consideration is the traffic source however. Also, in my view there is nothing wrong with flashy advertising or an eye-catching site as long as there is substance at the end of the line. As to the question of going back to the old style – you would need to analyze exactly when things started going badly and then ask yourself what changed at that time. Did you copy change? Your traffic sources? Your price points? The needs of the market? Declines in sales of high-quality products can almost always be traced back to a change. You know Charlie, maybe you hit the nail right on the head. As far as I can recall nothing changed, not in months or maybe even a year. We had not evolved. Perhaps it is time to go back and look over everything else except the site design and see if something else needed updating. The problem is the new “flashy” sites have not been up and running long enough to know if they have made any difference. I would recommend split testing the old and new rather than making a break from what was working. Unless you are getting much better results now then split testing will be a more scientific, and profitable, way to know what is working. Hi Charlie, I really enjoy reading all your emails. Thanks for all the Great info!! I always seem to get a positive mindset upon reading your articles. I believe integrity in any business is built on Trust and honesty. In fact I would just as soon give away all the knowledge that I have a gained for FREE! Why? RESPECT that is!! We are all on a Highway just different ones for each of us. This is what I have learned so far. If you take a left you will have many detours and cautions along the way and end up on a dead end roads which I call Turkey Lane or Shining bomb Rd.Have you ever been there?? I have many times over!! Okay, no big deal just turn around and get back on the highway. Now that you are back on the highway proceed to take the next exit to the RIGHT which will be Eagle AVE.There you will find no dead end roads just one ways which are safe and accessible along the way. Thank you Charlie for another priceless and inspiring article! #2: Some of the Internet sharketers force an upsell after upsell. won’t work properly if you don’t buy the upsell. If it sounds too good (for $47/$37/$27 pleeease buy my stuff…), it’s too good to be true. You hit the nail on the head with this article. Like so many others, I also tried flying with buzzards in hopes of making money on the net, only to lose from a person who went into the “witness protection program” when you started asking questions. I have been away from your teachings for a few months but now I am faithfully back with a true eagle. Keep up the good work coming our way. Great article Charlie! Thanks for the wise advbice. There are certainly an enormous number of very opportunistic deceitful people on the net who are very careless with the truth. It is also an indisputable fact that lies always need to embody some truth to appear plausible. They can not stand independently. They need some truth to cling to as they weave their tentacles ever wider and higher to engulf the unsuspecting and uninformed. Just think how long that poor eaglet was hoodwinked before it saw the truth. Thanks again for reminding us that are indeed eagles, meant by our Creator to soar high above all the mess we sometimes find below. Thank you for another great post Charlie, and staying with your metaphor for a moment, yep, there are a LOT of Turkeys impersonating Eagles out there so it is imperative to find a Good Mentor. Finding an Ethical Eagle is far superior to finding a Successful Turkey. The Ethical Eagle will bring you to Sustainable Flight whereas the Turkey, well, its just an impersonator, and a short lived one at that. You picked up my thoughts – 2 days ago I signed up for an Italian article directory… Although they were talking about the changes regarding their handling, clearing their database etc. – no hint that you have to pay for the service. This came out after subscribing and submitting the article. Then they told you that you have to pay or an annual or life time fee. The price is low and not the issue. Issue for me is that they are not sincere. These ‘bad boys’ are everywhere. 🙂 The good thing: There are also “really good boys” like you Charlie out in this www. Thank you Charlie for this great article. I especially get ticked off at the many sites that suggest you can earn substantial money without any mailing list, web site or product and they will supply everything . They dont even suggest what it is you will be lending your name to as a marketer . If im going to sell a product I believe in and am willing to lend my name to I sure need to know what is. Really great advice here Charlie, the internet is full of scam artists who haven’t made a legit dollar online except for the info. they just resell. Not only that, but they show stuff like fake screenshots of earnings e.t.c. thank goodness the FTC is cracking down on these types and hoepfully make the internet more accessible to the eagles that you talked about. I have lost thousands of dollars to these cheaters,scam artists and I couldn’t agree with you more.Surely there’s got to be a better way to present real plausible programs to people than to bribe or rip them off to get gain. I just hate the ones that says you only make a one time payment, only to find that when you fork out your money, thinking that you are going to start the fancy program you are told to pay 1000% more of the supposedly one time fee. Where are the laws governing or regulating this type of behavior? I guess we’ve got to continue to talk long and hard about these things and continue to educate as much people as you have done Charlie. Especially the newbies like myself. I’m yet to start making a dollar online and yet, I’ve spent so much trying to find that one good thing that would get me off the mark. I continue to learn from you. Keep teaching. Like you I have spent several tousend dollars on hypes and scams online for the last 3 years. In october 2011 I was presented to a company that I have earnd money from. I can work with it bouth offline and online. Ill never sign up with another program again. Like Charlie says, never work with something where you cant get a dialog with the “seller”. I hope you will find a company you can work with and be able to live your dream. I would say, let the turkeys alone. Buzzards are more fitting…they puke on people if you bother them. Now that’s more like the crooks in marketing. Even in MLM, I had a big shot recruiter promise me and some others, a free website that was already making money, if we joined him in a MLM weight-loss shake company. You guessed it, we never got the sites, and he’s one of the top in the company. I still have not heard from the company when I contacted them about his practice. I was told they would get back to me. yeh. I’m laid off, and now have a 600+ CC bill to pay off. I have been exactly where you are right now and I would like to help. Signup for my free report through the link so I will have your email address and I will send you something that may help, no charge. Yet again you have hit right on the button. i must admit that I have also fallen for the speciaL offer or upgrade, only to be disappointed with the end results. Since joining DOE I can honestly say tjhat you and your team provide a good, honest and reliable service to members. Something that is a refreshing change from the usual range of hyped up products we see every day. I feel exactly the same as the article says (“1. They “Teach” What They Have Not Yet Experienced”) when seeing how everybody claims to be a a WordPress expert – because they are running two blogs with that script… since yesterday. Even in a simple forum comment/post I am trying to “teach” only what I know for sure; i.e. I tested it, I experienced it, I’ve read the code – I know it works. Yes Charlie, all so true, I sometimes think we bring forth this type of marketer, simply because we do not raise our expectations. I myself use to ask a simple question prior to purchase to see if there was a person ready to help, if not, goodby. I have been lax lately, thing I’ll start up doing that again. There are some very bright new people out there selling products that can help many of us and they also have time to help if needed. We don’t need to settle for the too busy, aka guru, big shot, poor customer service anymore. you are right that crap will stop when we stop accepting such practices. The internet is definitely filled with lots of turkeys, and a few eagles. It is difficult to sort between the two sometimes. I think anyone can become an eagle if they make the decision to do it. It really isn’t that hard too do. And we need more eagles. Great article Charlie, hit a nerve as I have been stung too many times to remember, but as they say. once bitten twice shy. We have third generation welfare recipients; found an article referring to them as “welfare queens:” illegal immigration (cost is $133 billion/year to us taxpaying citizens) . . . But, still, many of us, including me, are blessed to be surrounded by family and friends and living in a great community of people who reach out to help others by volunteering, fix something for an elderly neighbor, and smile at strangers! If we all reach out to help just one other person, we all will make a difference. Great article indeed from the BEST and HONEST marketer. You are right on. The world is full of turkeys. I have been around long enough to build several successful offline business back in the day when you were dealing with folks face to face. The trouble with the current method of marketing online is that you do not look the other guy in the eye when you are dealing with them. Everything is now based on perception. Ethics and morals have gone the way of the endangered species. You no longer are judged on truth but on the perception of truth. When trying to convey an “honest” desire to help or to sincerely offer a product or program that I have found to be honest, ethical and moral I find it almost impossible to find words that have not been used to promote offers that are worthless. Unfortunaely, many of our industry leaders are as guilty of using perception instead of truth as the newbie that accepts this approach as the norm. I agree with what you said about using the same words as those used to promote worthless products. Sometimes we can’t help using the same words because the bad actors clearly copy the good sites because that makes them more credible. I believe if you give your audience value, respond to them and your desire is to help them then the words you use being similar to others’ wording won’t matter. What you do will show more than what you say, even on the Internet. Great perspective – thanks for writing this. We have to remember that in many ways this is not a new phenomena. Shysters, opportunists, scoundrels, thieves, and quick buck artists have existed since the first days that money was invented. The difference today is that technology makes it easier for these folks to prey upon trusting souls, and they can easily find us (or we find them) through our portal to the world – the internet. Especially when it comes with cool websites, testimonials, images of last month’s checks, It is also human nature to grab onto some of these things in our zeal to find some things to make our own life easier. This is a perfect storm for combining shysters and seekers of a better life. There are some things we can do to fight back – first follow these guidelines that Charlie has laid out – they make a lot of sense, Don’t do business with folks that don’t meet his criteria. Second, work hard to find honest people to do business with. For example, there is a level of caring and sincerity that comes across in Charlie’s enterprise – there has to be more folks out there to like him to do business with. Third, when you run across people who are doing this kind of thing, let others know about it, including the third party money collectors like paypal or clickbank. There probably should be a website where people can report their experiences – sort of an online better business bureau. Hit ’em where it hurts. The internet is still a bit of the wild west, so be careful out there, and make your choices wisely. Very well said, Charlie. Credibility should be foremost in our minds when trying to sell something online or offline. It takes time and effort to build credibility and reading one slick article does not do that. Nor does listening to one webinar make me an expert as so many claim. Keep your down-to-earth common sense coming. We need it and benefit from it. After almost 2 years on-line, and a whole bunch of time and money wasted on these turkeys, I have finally found two eagles, one is Charlie Page and the other one is Chris Farrell both of which I am a proud member of. I have also tweeted this to my friends because it strike a chord with me. Thank goodness there are eagles out there to watch over us would-be-turkeys!! For the past year I have been looking for the “ideal” business. I put just about everything I was doing on hold. Why? Because I woke up one day and found myself in the midst of a whole flock of turkeys! I had lost sight of my reasons for doing anything… so, I stopped everything! For that year I searched, experienced, experimented, spent a boatload of money, days weeks and months of time… and learned a lot!!! I learned that I stand for something. I learned that I have values worth holding true to. I learned that some people will take what ever they can get and then blame you for it. I learned that I am responsible for every outcome in my life. I learned that I can not associate with energy vampires and think I would not become one. Then, one day, I “met” Charlie Page. It has taken a few more months to really think about and see clearly enough to begin to impliment all that Charlie teaches about working online but, bit by bit, it is all coming together. Though the technical aspect of working online has been daunting, the learning curve is a straight uphill challenge, following the example shared by Charlie has been worth the effort and I am still hanging in there. The most important thing I have learned from Charlie: To be a success in this business you must have two things; skills and a team. Charlie has, is, does, and shares both! I have a very simple principal – I NEVER even READ One Time Offers – I just scroll to the botrtom of the page and click on “No Thanks”. Easy, really. I recently signed up with the DOE, after having received quality articles from you for a few months. Besides the fact that the DOE offers value for money, the real reason I signed up was that a few months previously you had answered an email I sent you. The fact that you took time out to answer showed that you had integrity and cared about helping people solve their problems, unlike previous responses I have received or the responses I anticipated but did not receive. I look forward to learning a lot more from you and in turn helping others once I have gained enough experience. Great article, Charlie. You are one of the very few marketers who genuinely wish to see others succeed. I have been reading your articles for more than a year now and I am a better person because of it. There is real value in everything you share with your readers. May the ALMIGHTY continue to shower blessings upon you..
eagle and analysis for large heights. Hi Charlie…..good stuff! I call the Turkeys “Black Holes”. Keep up the good work. Your a good man Charlie Page. A great Article from a great man. Every word is so true. I have walked into turkey traps a few times and wasted my money, as you said Charlie, only to never ever use this downloaded rubbish. I think I still have some of that useless stuff on my computer. You are so right with the “feeling pressure to miss out on something”, I know the feeling. I am grateful that I know better today and don’t waste my money anymore. Thanks again for this article, I enjoyed reading it. run into a few. I am learning though and with your help will be able to spot them. Thank you, Charlie. You are one of the few marketers whose emails get opened every time by me. I always learn something from you. Consequently, when you are promoting a product, I do check it out. I know that I can trust you. A very wealthy man once said that “wealth was a result of providing value to others.” I can only conclude that you must be wealthy, because you always provide value. My pet peeve is the pop ups that tell you to click the cancel button 4 or 5 times. I do agree that ebooks can be great information. Unless it is total garbage one can always learn something from them. Some people give away better information than others sell. Some act like lawers! If you talk to them for five minutes they want a hundred dollars or more. I too hate those websites that you just can’t seem to get out of…they won’t take ‘no’ for an answer! Pop-up after pop-up. And the ones that have only 24 left but you click on the link days later and there’s still only 24 left! I appreciate your honesty. It’s very refreshing. Thanks for a great article. Thanks Charlie: This article is dead on. They lure you with a “‘not $197” not even “$97″ but just $37.” Then your told that if you really want to make it big, there is a host of upgrades costing $297 or $197. I also receive these offers from several different people using the exact same words. It seems like a fraternity peddling these programs for one another. callie. You are always right on with the right info. Keep up the good work. You inspire all of your followers. Thank you Charlie for taking the time to help those who’ve been victims of those types of marketers, who only want the money. I’ve always been the person to look further than what is presented, so I’ve not been taken advantage of by them. I’ve bought a few things online but from those I’ve followed for a while and liked what they had to offer, which has never been a “bait and switch” selling tactic (selling you one thing and then have an upsell that’s really expensive). So I’ve been pretty lucky, I bought your lifetime DOE. That Information are Priceless! Many nights turkey make me slip less. Greetings Charlie: Want to take time to personally thank you for the article. Great content. Your valuable information will keep me from falling into a snare. You always keep your audience updated. Again thank you. I like this Charlie, what you said is very true. This happens online and offline. People no longer care about helping others but themselves. This is what i see in the real estate side, when it comes to learning about new strategies, raising funds, or how to get started as an investor. As I am very new here it is very clear to me that your writing comes from within and your high caliber character is more than obvious. Your words put together after the mid hour reminds me of a sine qua non prayer. Thankyou for your Sunday thoughts.I have subscribed to your emails for a while now.I’ve read reviews about you on Warrior Forum, and by and large have found them favourable (UK spelling). I have not bought into any of the things that you have offerred me DOE or otherthings. I have been online for a good few years now, and I must admit, to my shame that I have not made ” a mark a yen a buck or a pound” online. This has been ,in the main , a lack of due process on my part.I, like so many others , fell for the so called gurus story, which promise all, but deliver nothing. I am sorry to say that I spent thousands, to achieve nothing. I like to think that in the real world, I am fairly switched on, but online I fell for various snake oil salesmen stories. Although I am convinced that the sheer scale of the internet, offers much, I have become so sceptical of offers of opportunities, that I do little. I have also become sceptical of USA offers, because the legal recourses are different state, from state,making litigation difficult. Now, I do know that you are not in this category,I do know that you are an ethical marketer..the evidence is apparent. What I don’t know is , how would you be of help to me..what assurances are in place.. and how much would it cost. I am not being nationalistic in my comments..I get emails from a so called mentor here in the UK.I don’t have any more faith because he is a Brit,just that he lives a lot nearer to me if he’s a crock of ****, and I won’t have as much travelling to to scratch his Ferrari. Anyway mate, I do appreciate your breath of fresh air, and hope that your Sunday was a good one. Thank you very much for the fantastic email. I might be in internet business if I had seen it then. I am 89 years young and just got tired of struggling for nothing. I will tell you that I am not a writer but the challenge of writing a book saved my life after our daughter was killed in an auto accident. are an anchor in the wind tossed ocean of internet marketing! Thanks Charlie for keeping it real! Need more mentors like you! “Ethics” and the “internet” have become oxymoron terms. So sad and unfortunate. Have seen too many oxymorons now in internet marketing and I have also burnt my fingers in quite a few so not its easy to spot one. I don’t even need to watch the whole video or go thru the entire salespage to identify the crooks. But thank God for the real ones who are few and far between but still exist. Great post as usual. How do you do it every time? Yup, that’s been a pet-peeve of mine too…along with the forever ongoing sales letters, and the seemingly forever ongoing pop-ups…’don’t leave this page’ or ‘before you go’ ect. I’ve thought about using those tactics myself cause I figure they just must really work…but you’ve inspired me ‘you do that alot!’ to not give in…I’d much rather be an eagle and soar with you. Thanks for the kind words. I think using an exit pop up is a good way to market but think that using multiples (I’ve actually seen seven) crosses the line from saying “how about this?” to trapping the visitor on your site. I’m a brand new member and I love what you’ve done with the place [DOE] ! Thank you seems so trite and inadequate, so thank you, Thank You, THANK YOU! Boy, did you hit the nail on the head with this article!!! Fortunately, the offers I fell victim to were all Clickbank offers so it was easy to get a refund. Upsell Jail… yes, been there, got stuck there more than once. I won’t name the perpetrators, but I will say that the affiliate offer I’m in now, did not do ANY of those things. He is one was has actually made his millions and teaches by way of video tutorials & email. It’s wonderful. I’m not here to try and sway anyone to come my way… just wanted to say, THANK YOU! And, I don’t feel alone having fallen victim (5 times) to those various turkeys! Just glad I finally saw the Eagle and joined up with him! opportunity that i offer through my website. It is a proper nuts and bolts business, that i have run for 43 years. It baffles me how anyone can make a living selling e books that in reality do not make any money for the silly person who is daft enough to purchase it, knowing it is going to be discarded after a couple of days. There must be a lot of nieve people in this world. Still they say you learn by your mistakes. Interesting comment. As the author of 10 ebooks, in addition to other print books, I would disagree that one can’t make a living selling them or that people who purchase my books are daft or that they are not helped. But I do appreciate your comment. And you have an interesting site. Thank you for this information Charlie, I’ve come across quite a few “Turkeys” who will not answer if contacted, and leave no phone number to be contacted. I am now asking on google for reviews, honest reviews, on who these folks are and what they are trying to market. Alot of those reviews come from the warrior forum and I think I trust this bunch as they for the most part have had experience in the marketing field. I’m still new to all of this and progressing as time permits, my day job is what takes me away from it most of the time. Well, thank you again and I’ll be looking forward to more exellent posts from you. for all the turkeys I’ve got, i got food for a lot of years to come! Great information as always Charlie thank you. Pity we couldn’t have a Turkey Shoot? I’ve got eagle copywriting characteristics, but when it comes to developing my own info products, I’m stuck with the turkeys. Why not turn your eagle writing skills into a business and write for those who can’t? I wish more marketers were like you. Thank you! Yeah, wow it’s a universal experience. There must be something in the air. What a marvelous response to an awesome set of words. Excellent and really helpful article as always, Charlie. Listen to monkeys and you’ll get peanuts. This is just great advice that so many people, newbies and experienced alike, really need to know as it seems it is easier nowadays for anyone who can write a reasonable sales letter to con you out of your hard-earned. The advice about feeling your way is also just brilliant and it tends to work so long as you’re really tuned into your feelings and not just feeling excited by the emotional manipulations of the sales letter and website hype. You and your work are a fine example of someone to listen to. “Listen to monkeys and you’ll get peanuts.” LOVE that quote! Excellent points on finding the Eagles online!! I hope all the turkeys read your article!! Thank you for your continual high integrity and your experienced knowledge in being someone we know that we can trust and upon whom we can depend! Wonderfull, I do all of it, and yes, because I want to suceed, I am vulnerable to the discovery process. That’s one of the reasons Charlie that I have not unsucsribed from your list, your an Eagle. So is Rich Schefren, he opened my eyes to the opportunistic mind set as opposed to the strategic entreprenure mind set. Thank you for being an Eagle Charlie. Thank you for your kind words. Mindset does matter and few teach it better than Rich. excellent to the point article. Too bad that the turkeys will continue their devious means of selling. It doesn’t matter. In the long run they will not prevail. Knowledge is power so if you know what to look for you will be able to stay safe while working online. You’ve obviously hit a sore spot with many readers, me included. I always find your perspective and words of wisdom welcome. Grand Salami! That was very a great give back to the entrepreneurial community. Way to go, Charlie Page! Conversely, I was compelled to make mention the important role of the turkey. It is hard to imagine a Thanksgiving meal without the centerpiece of the glorious bird that God graced us with. We need them too, for balance in our lives! Back to your point and context though, let us recognize them and organize for the best use. Is punning the lowest form of humor? Perhaps not: after all, limericks are verse. Again, thanks for sharing from your heart with a heart’s desire to help others. Thanks for the valuable information in your article, I’m in marketing and the work of money on the Internet four years ago, did not meet any site or any person who speaks so openly, never like you. I knew that all the sites just to sell something to you. The important thing is I hope the next time you write something in which we advise us where to begin and what is good work to make money online? I do not buy many things online these days but have in the past and seen this marketing strategy many times only to go back to the page and it is still offered even after you leave so not really gone as they claim some yes but most no>love to read your articles and what you do I have been a DOE member for a long the not sure how many years but awhile. One more thing I sent you a card in the mail when you and your family were displaced for awhile did you get it. During that time I had my staff handling my main and phones and candidly have not caught up yet. I’ll check though and look forward to reading it. Thank you for sending it! Over the years I’ve developed a list of turkeys but not many ont the eagle list. Mind sharing your “Eagle” list? Happy to. In fact, I’m adding a review section to the blog soon and will be reviewing products and the people who make them. I’ll give you a sneak peek – one of my favorite people is Jimmy Brown. You can see his main site here. I’ve bought many of his products, with and without resale rights, and they are usually top notch. Jimmy is an innovator in marketing, doesn’t play games like false scarcity and his products are a pleasure to promote. Great article and oh so true. Knowledge will keep you in the relm of eagles. I’ve fallen for thst “upsell” scheme a number of times. Thankfully, I was able to get a refund from Clickbank. needs good, honest leaders like yourself. I am not but God bless you for doing the work! it is always there…in our harts. Thank you for the refreshing post. There are alot of pressure ads out there. I think we all have bought from a turkey one time or another. Would love to join Ezine,but cash is a little tight at the moment. No worries. We’ve been here 13 years and will be here when the time is right for you. Thank you for leaving a comment. Thanks Charlie for this great post. I had to learn this the hard way a few years back. As always, I gleaned valuable info from your article. I thank you. Thanks for all you do. I recommend your stellar services daily. Thank you for such a great post this morning. You wrote succinctly how I generally feel. I sure appreciate reading this as it points out the basic flaws in all selling, online or off. As soon as I feel pressured into the buy, even in person, I back away quickly, especially if I sense the sales person hasn’t experienced or has no idea what he/she is selling. There is no such thing as a “final or last chance” offer. Those offers come every day. If you don’t catch a good deal today, there’s always tomorrow. LOL. Great tips Charlie thanks. I want to soar with the eagles, this articles makes me take a look at how I do business, not that I would scam someone but I ask myself if I’m not trying too hard to make a profit, do I place making money above doing what is right? Do I practice the golden rule of doing unto others as I would have done to me? Thanks for the article Charlie. Great article and good advice. As others have said, we all become stuck in the “one-time” offer, that is “closing soon”, and “you will not see this again” loop, and then figure “it MUST work because so many people are doing it – so I must do it too”. One thing I’ve noticed is how easy it is to replicate the “sales” spreadsheet or “real-time” sales videos.It’s “turkeys” who use tactics like that because the “food” is easily available. And we all know turkeys don’t hunt – they just go for the easy pickins. There is one caveat to your metaphor: Eagles also hunt for prey. The key to survival is not to become easy prey. I too have grown weary of the unscrupulous antics of less-then-principled persons (No-names and Big-names alike) whose every email is laced with misrepresentation, manipulation, and mendacity. Lies, Lies, and more Lies! I’m thinking now of every “cryptic” email I get with a misleading Subject Line or one that gives no indication of what the email is about … to Sales Letters written in “double-speak” and laden with empty promises. There ought to be a Law! Why isn’t there a “Cyberspace Authority” that can IMPOSE ethical conduct on everybody who maintains a presence on the WWW? Personally, I don’t think this is too much to ask for! We humans are capable of achieving virtually anything we can imagine. It’s time we put some consciousness-raising brain power behind an effort to “clean up” and then ride “shot-gun” on the Internet … Checks and Balances! We need an independent “Cyberspace Authority” (with a free-hand!) to protect consumers from the scandalous behaviors running rampant on the Internet. Charlie, I am absolutely certain that your name would top the list of those most qualified to draft a document calling for “Ethical Standards of Conduct on the World Wide Web.” The article you’ve just posted is a perfect example of someone who is already teaching, warning, and doing all he can to protect his Subscribers … until the Internet can be transformed into a “consumer-safe” environment. (NO flattery here, Charlie … simply the truth.) Shalom! Thank you for your kind words. I agree that accountability is a good thing but there’s no way to oversee a world wide enterprise like the Web that is basically anonymous in nature. There is no environment where the phrase “buyer beware” applies more than the Internet. That said, there are some excellent people working online, selling products and promoting products they use and belief in. I feel that if you look at the person behind the product, and look at the track record, you will stay safe. I hate getting emails on Sunday, my day, but I had a feeling that this would be a good one, and not only does my responding to it recognize the value of what you wrote, but the overwhelming response in comments verify the value in all that you had to say, also. Personally, I don’t think you went far enough in breaking down those who are detrimental to those of us trying to do the right thing, and the methods used to line their pockets while we struggle to recognize the value or non-value of what is being thrown at us on an everyday basis. Honestly, in the year or so that I have been pursuing this I could nearly write a book on these methods that IM marketers use and what are the dead giveaways that they do not have our well being in mind. The mere fact that you were willing to write an article like this puts you in good steed as to my thoughts about you, but also the hope that there is honesty amongst those that we depend upon to better our own lives, and it is here you really shine. Thank you Charlie Page. I know how you feel about writing a book! From answering questions and having the answers sold without my permission (I thought I was helping the person) to a person on Fiverr selling my free book last week, I’ve seen a lot. I’m comforted by knowing that the bad actors won’t win in the end. Any victory they achieve will be temporary at best. Thanks for taking time to read and reply. I thank God for your integrity to be truthful and honest . You are a real man. Your business will continue to flourish as you continue to keep it real. You are an eagle amongst a lot of vultures whom i and a lot of innocent want to be successful IM’s have been eaten alive and made to feel stupid by their upsell tactives. Half truths, no truth, and straight out lies! I agree with everything you say. The people I feel sorry for are those eagles who are genuine and would never deliberately mis-lead you but they are tied to programs run by turkeys and often do not realise it. I have been conned many times but I see it as part of the learning curve. I will be joining D.o.E shortly and I know I am in safe hands. Thank you for sharing your thoughts and for offering a glint of hope in the often dark world that is the internet. Thanks, Charlie. Fresh perspective, as always. I’m in IT training business and though I’m not a huge fan of Clickbank in general, your message definitely applies to my dealing with various vendors that sell like “eagles” and deliver like “turkeys”. That’s the “long version” of one of my favorites – “It’s difficult to soar like an eagle if you’re working with turkeys!” And, as you rightly point out above, the world seems to be becoming filled with turkeys and sorely lacking in eagles. Oh boy oh boy, the OTO! Charlie once again you’ve hit the nail on the head. In a landscape of WSO offers, Make $1 million a week, beat Google at its own game, the ultimate SEO software, and on and on and on. Where is the oasis of truth? Sometimes I get the feeling there is a consortium of Internet marketers that get together with the sole purpose of feeding the uninitiated crap disguised as hope and promise. I think it’s fair to say that the term “buyer beware” was never more appropriate then today. Technology and the Internet are changing, that is true. But the reasons why people buy and how to make them click on the check out cart remained the same, and it’s not by bullying a buyer or making him think he’s stupid for not buying a certain product. I would be willing to bet that the stats on refunds are much higher today with these outlandish tactics. Thank God for the DOE. I look forward to the new changes you are initiating. I agree. I received a joint venture request a few weeks ago where the person was bragging that his refund rate is actually … wait for it … under 60%. Sixty percent! Amazing. Thank God for being an eagle! and helping others to realize who they are. THANK YOU!! Unfortunately there are so many unemployed people (I am one of them) who are trying to make it and desperately tries anything and everything. Well, I’m not doing that any more, recognizing what you just said, and it is frustrating to see how “the turkeys” are trying to sell “products” without saying what it is. Again, thank you for voicing my thoughts. Hopefully the turkeys are reading this and start looking at their business. THANKS FOR THE GREAT ARTICLE, VERY INSPIRING. UP AT 4.30 IN THE MORNING, HERE IN LONDON YOU WOULD FIND IT VERY COLD,DARK, WITH SNOW STILL AROUND. BUT SOME THOUGHTS LIKE YOURS REMIND US THAT WE ALL HAVE THE POTENTIAL TO SOAR, EVERY HUMAN BEING HAS A SPARK OF OUR CREATOR WITHIN,AND NO MATTER HOW DOWN A PERSON MAY FEEL, OUR CREATORS LIGHT IS ALWAYS WITH US. MAY THE ALMIGHTY BLESS THE WHOLE HUMAN FAMILY AT THIS VERY DIFFICULT TIME. You have done it again, the article is inspiring and very thought provoking. Now i know how to discern between a Turkey and an Eagle. Hi Charlie, I”m so thankful for your good counsel. Knowning you are a Chrisrian gives me confidence in your advice. at age 83 and rather new in building my business I’ve made some on the dumb decisions you mentioned. I recentley got in one of these $47.00 specials, 100% money-back guarantee and when I found out all the “add-ons” I had to buy they’ve run me around the block again and again trying to get my money back. Thanks again,God Bless . Bob Hilsmeier P.S. I hope you can get a nap today after getting up at 4:00AM. Thank you, Charlie. It was wonderful reading for Sunday. Your thoughts and articles are very instructive and so intelligibly written. The sad thing is that when somebody gets involved with the wrong marketer,they incorporate these techniques into there own marketing not realizing that they are perpetuatingd this system which permeates the internet. It is more important than ever that your phylosophy by brought to the internet newbies. Thanks for a good Sunday morning read. You know we can follow the turkey farmers to slaughter house or like the eagle flying high above the prey, stay focused, dive at the target then claim the prize. No matter what we do we are poised with choices. So try to surround yourself with eagles who are professionals in their field of expertize. Be prepared and trust the fact that the eagles will point out the turkeys. Thanks, Charlie, for being an eagle and treating everybody that way. It is 18h45 in South Africa. and are realy suffering from info overload. If the info meant something, I wouldn’t complain, but…. I so agree with your words. I know one thing from now on is that if the video has no controls for me to stop and rewind then I am NOT going to watch —I do not like being captured and forced to listen to fluff and drivel. Get to your point —-sell me your value! Another gem of wisdom from Mr. Ethical. Unfortunately, lots of gurus continue to emphasize the up-sell to their students, thus repeating the process. I even heard one guru say there’s no such thing as hype, that we may say we hate hype but our actions speak otherwise. The reason these gurus emphasize the up-sell is obvious: they know the real money’s made on the back-end. What they forget is that it’s far better long-term to establish a high level of trust with new customers. And that means holding off on the immediate gratification of the quick buck. I agree. The reason there is so much over-promotion these days is that people fail to take care of their customers and so are having to always look for new audiences to reach. I’ve longed believed that if you take care of customers they will take care of you. Charlie, you are right, as usual. The thing that these people overlook is a well known marketing and customer relationship management statistic. This statistic says that it costs seven times as much resources – time, money, energy, phone calls, hand-shakes, whatever – to find a new customer as it does to retain an existing one. Why are these turkeys so busy ignoring their existing customers and trying to hook new ones? Faulty comprehension of what their own goals are, I guess. The problem seems to be universal, and as you point out, it is growing rapidly to epidemic proportions. I suspect that this will ultimately lead to some sort of meltdown in the online business world, something similar to the worrysome financial problems that we are seeing now around the world. What’s the best way to avoid getting burned in the meltdown? Good business practices, consistency, and truth-in-business are what I would suggest. for one click sites , but also false targeted advertising. Charlie, Thank you so much. Honesty in general bussiness and internet is hard to find. Where where the days when a man’s word was his honer? Turkeys may catch us during the year, but they see “the short end of the stick” with Thanks Giving and Christmas! Again, Charlie you have proved yourself a giant among IM’s with the testaments posted here today. I’ve been a DOE member for 2/3 yrs now and everything you publish is concise, factual and inspirational. I’ve been to many top named gurus’ webinars and bought into their courses and the general consensus taught by these IM giants is, “HIT THEM, WHILE THEY’VE STILL GOT THEIR WALLETS OUT”. This seems the normal practice, not only from lesser IM’S but the major players and i think what’s happening now is people are becoming more savvy. These top guru’s are realising and or having to consider selling for less monies. Eventually the penny will drop so to speak and they will come to your way of marketing. Well you are an Eagle Charlie and these others are rodents. Thanks Charlie, I have experience this and wasted time and money. I now have very few people that I follow. Thank you so much for your great article. Thank you for the inspiration and passing your honesty and integrity to all of us trying to make some money online. I will definitely will be looking out for the “Turkeys” and searching for the eagles. Thanks again and may God Bless you. Thank you Charlie. Looks like you’ve stirred a lot of sentiment among us who are put off by the hype, lies and deception. Aman! and Aman! I feel that a good sermon on Sunday morning deserves a hearty aman. Yes Charlie, you are right on the money! So now I look for long term relationship from the “gurus” and to see if they are just out for my money or if they really want to help me. In truh, I am narrowing down my IM efforts as everything is going to Smart phones and pads. This is my future focus! After 5 years chasing Internet Marketing (and i made the mistake of never building a list) the one thing that IS WORKING FOR ME NOW is I have become a publisher on Amazon Kindle and B&N Pubit. Sales are good, and slowly going up. Yes, I did get slapped a few times for putting out crappy ebooks, but I have learned my lesson, and now all my ebooks are of good quality and effort, and now overall, do well sales wise. I love this publishing because there is no google or youtube to take down my stuff just because somebody gets a hair up their ……..
I’m on the verge of putting my books and reports on Kindle and BN as well. I’m happy it is working for you and do believe it is a strong model for most people. Sadly, most are overlooking it now. I will disagree slightly about IM and the smart phones and tablets. I don’t see a shift in that direction as being bad for IM at all but rather an opportunity for those who know how to build relationships and lists and offer high-quality products that deliver value. I’m moving all my membership sites to a mobile-friendly platform for this very reason. Follow Up Selling Systems is moved and DOE is almost there. So far we are seeing lots of members accessing Follow Up Selling Systems on mobile, which is a good thing. 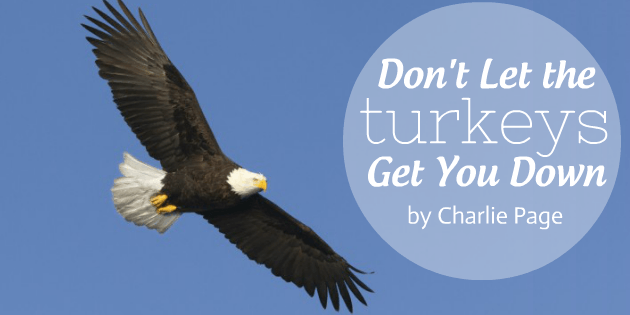 Well said Charlie… The Turkeys days are coming to an end! That is why Thanksgiving was created! All I can say Charlie is WOW… In this business we’ve all experienced the Turkeys (there seem to be so many). but there are eagles and you are one of them. Thanks Charlie. Every word of your article resonates with me – I don’t dare count the money I’ve spent on the turkeys and their false promises! It’s been a long slow learning curve, but I’m getting there with the help of genuine people like you and one or two others that I now know I can trust – the rest, it’s just ‘unsubscribe’! As usual you inspire me with more of the same content that conferms what I also say . Honesty is the most important thing. I have herd it said a little different ,but it meant the same You can’t hoot with the owls at night ,and still soar with the eagles all day. Wow, your passion really comes through. I’d like to interview you for “Access To Experts” on this very topic. What are some of the misconceptions people have when in comes to buying information products? If you’re open to it, let’s get it set up. I am open to it. Please contact Hope at my support center to take the next step. Well said brother! You nailed it. IT HELPS TO KNOW THAT THERE ARE GOOD PEOPLE ON THE ITERNET. I WON’T GIVE UP TRYING!!!!!!! That is a great article! I am with you on what you say. i litterly hate to get an email that says it is free, then you have to give your email address again and again, only to find, when you finally do all of this they will hit you with a page that sells the greatest thing that has happened to man kind for $37.00,this offer is already worth umteen dollars, for this paultry sum! Then up comes another page that will give you another $10.00 off this already fabulouse offer. This type of tactics makes me sick! It seems to be harder each day to distinguish between the Turkeys and Eagles. I would like to see some one with enough confidence in their product to make you an offer, that if it dod make you money, THEN they would accept payment after the fact! I would be willing to pay two or three times what they have to sell it for, if i could see some return on the purchase! I will join your DOE as soon as money gets a bit thicker. i have bought multiple OFFERS, in the past but have become leary of about all! I like your style and i believe you are someone I can trust. Thanks Charlie love your articles, you are the real deal. Always giving, such a refreshing change from the vultures soaring over head. As always you rock! Thnk you for everything you always say and teach. We in the Hunter household Love you and thank you very much. God Bless you always. I just wish more internet business persons were as brutally honest as you are. I think Alex Newell gave a good insight when he said “And then there’s the clickbank and warrior special offer sales pages…” as I have quit buying from them. In fact, I’ve probably gone after refunds on the vast majority of my purchases from these “special offers”. They’re usually GREAT BIG TURKEYS! Thanks for the message on this Sunday morning. Good read before church. Sometimes it’s hard not to get down when you get beat up with all the Fake Marketing materials online. I have lost a small fortune online. But keeping my head up. I still have faith. I know deep in my heart that there is a way. What makes it so hard is when you know that you have something everyone will want an can’t get to them. I’m a new member of your DOE an praying the DOE will answer my prayers. AllI can say is THANK YOU!!!. One thing I love about you is that you are honest. We need more of that in this business. May God contiue to bless you as you deliver quality information. As usual great article Charlie. I learned the lesson hard way after wasting lot of money on turkeys. A breath of fresh air this Sunday morning. you nailed it right on the head. and it good to soar with eagles. Great post Charlie. You mention the current ” trend among websites to not answer pre-sale or non-customer questions.” Well I’ve noticed how many don’t offer any POST-sale support. Sad really, but I guess all the better for those offering honest and true value. It’s just a shame that oftentimes one has to get burnt by the frauds before finding the real deal. This write up is just Awesome Charlie, You’ve done and hit the nail on the head .. And Again I must ad. Deception of Appearance .. or the .. Appearance of Deception .. (I coined this yrs ago) .. Which is Worst ..? That’s how most people doing business on the web act .. like they were raised up with No Integrity. They lie .. steal and cheat folks out of their hard earned money so they can get rich quick by burning others ..
these folks are what we call in today’s modern world .. GuRu’s. I have been burnt more then I care to admit. There are a few Guru’s that actually do have some kind of Integrity and make an Honest Living from the net. Words of wisdom, for sure. Thanks for posting this. I’m going on 42 years. You see, I couldn’t afford to get married more then once! I’ve experienced everything that you’ve written about in this post. But, at this point, I’ve finally learned to tell most of the turkeys from the eagles. Thanks for re-affirming things for me! Great words to live by, Charlie! Eagles soar; turkeys strut. Which one ends up on the Thanksgiving table? I think the turkeys you are talking about are really vultures. The eagles still soar way higher then any of them. Thanks for the great inspirations. I agree with John. I think there are plenty of turkeys out there, but there are pretty harmless. It’s the flesh eating vultures that you really have to watch out for! Well, it’s Sunday morning and appropriately I say AMEN! I have never made a cent after two years on the internet, calling myself MARKETING. It’s been a lot of money and like some of my fellow searchers for the truth, I find myself still being manipulated — though not anything like before. The common one is the front end stuff about how a particular site is going to change my life. Often, as these things go, it’s quite persuasive. But what I now know is that once I pay this fee, which by implication is all that’s needed, I move in to what is REALLY NEEDED to make money. Here there are often at least three more requirements usually at (1) $97.00, (2) $197.00 and (3) $197.00….Then, MY LATEST WAS THEN PERSONAL, CHARLIE! Here I got a telephone call asking how much added money I had, say, maybe at least $500.00 or more! I HAVE SENT THEM A REQUEST FOR A REFUND AND I HOPE I DON’T RUN INTO ANY MESS GETTING MY MONEY BACK. Thanks for being you Charlie, character and authenticity I personally find rare. Any recommendations on with whom I might find these attributes as I search for somewhere to go — not to get rich but to simply add $500 to $1,000.00 monthly? Someone who can be trusted? I assume that exists but I’m struggling! This is excellent and so true. If only the others would follow you ethical stance here. It only means that all of us consumers must remain wary and look for value in all the ways you here identify. And for those of us who do sell and teach – we need to follow these guildelines for sure. As a general rule I’ve always tried to give away 10x more information than I try to sell. This is not just to be an effective and trusted information provider – it is also because I think if we sincerely want to help other people improve their lives. If that is one’s first goal the money will follow. You help reinforce a standard we should all follow. I like to read so I do read my e-mails even on Sundays, when I see yours I often print them out because they are worthy of ink and paper and I can keep them close at hand to review them, and this one in particular is great. Yes, when I first started on line I was suckered in possibly believing all people were truthful, but they are not and the Turkey versus the Eagle clarifies that! Yes, I only look for Eagles now-a-days, not to say that I still haven’t been fooled….especially with a good priced product and then 2 or 3 others…those I don’t want to deal with! It just goes to show you that they are dishonest and get you in, but I have learned that you can cancel these people right out of your life. Thank you so much for all the great e-mails, I will always look for yours, please keep them coming…..
Finding your words on this Sunday morning is like a salve. It is always so refreshing reading from people like you, who are an eagle, express the same thoughts one has had for so many years of frustration and lies, because one has been moving among turkeys. This, I believe, is the norm among all of us who tried to become a part of the Internet Marketing Dream without any knowledge, and became a part of the Internet Marketing Nightmare. I still belong to the frustrated, but keep trying very hard, so maybe one day I can become an eagle too. Very inspiring and very true Charlie. Like many who desire to earn a living on the internet, I found the turkeys first. I am just glad that I am on the right track now. Thanks again for the great post. Charlie, you have a knack for hitting the nail squarely on the head! I think all of us that are involved in Internet Marketing have come in contact with Turkeys at some point. Your blog should be required reading for all that are starting out in Internet Marketing. Thanks for sharing. I copied and keeping by my computor. Again thanks for sharing what God put in your heart. I will share this with others firends. Good Sunday morning to you, Charlie! Thank you for writing and posting this article. I enjoyed reading it. I first saw the network marketing business model at age 19. I am now age 53. Every time I tried to make network marketing work for me between age 19 and age 52, I failed. That is, until at age 52, I discovered 4 “Eagles” who walk the walk and not just talk the talk. These Eagles have taken me by my hand and shared with me the “skills” that they have used to become successful. And, after I learned these skills and started applying them, I, too, began experiencing success. I now get very excited being able to help other frustrated network marketers succeed in this industry by teaching people the “skills” they need to succeed. For example, I spent 2 and 1/2 hours yesterday with a person setting up their advertising campaigns and teaching them how to effectively market himself online. I also taught him a One Minute Business Presentation so that he may effectively market himself offline. I also make telephone calls with new business partners so that they are able to hear what I say and so that they may learn how to be effective on the telephone by listening to me “walk the walk”. I teach new partners how to effectively advertise for “free” before ever teaching them how to effectively advertise by investing money. Often people thank me for helping them and they tell me they are amazed by how much of my time I freely give to them. However, I have learned that the more I give the more I get. I am an Eagle and I teach people, like you do, how to spot the “Turkeys” versus the “Eagles”. My team and I teach people “how” to think instead of “what” to think. Thank you for allowing me to share! Oh so true! Like may others, I have had the experience of spending my hard earned money on various “turkey promises”. No more of that for me. I’m flying with the eagles from now on. Thanks for your insight, honesty, and willing ness to share your knlowedge. THX! You are speaking truths that need to be said. I appreciate you and what you stand for. Thank you, Charlie, for the Sunday message. It’s taken me years to learn the hard way about these tactics! I’ve often wished just one “expert” would tell the whole truth in their sales letter or video instead of keeping secrets until you’ve paid for the initial product. There is nothing more frustrating than to but it, and then find out it does nothing without the upsell! So true, Charlie. There are plenty of turkeys out there. I’ve fallen for the sales hype myself and often the products are not worth the paper they’re written on. They are obviously written by an outsourcer and not someone who has ever used the system themselves. Or, they’re so generic as to be useless. We are offering training on using private label rights content for profit and are filming ourselves using the techniques and strategies we teach. I’m hoping this makes the information truly valuable and helpful to people. There is definitely a movement towards more transparency, which is great, and I applaud those of you leading the way. As well as yourself I salute Pat Flynn and Adam Short for sharing their real experiences of making money online, and being so generous with their teaching. Good article. Thanks for the tips. This is an awesome post – and I’m glad that you wrote this. I just wish more leaders like you could do more to show up the bad eggs that are really causing havoc on the internet. I am just hoping that a lot of people including the newbies see this. The under-hand tactics that are being used by many of the so-called gurus has taken on a new dimension of what seems like desperation. I have purchased products in the past where you have to go through 5 or more upsell before you can finalized the transaction. Its obvious that many of those people are just looking for a ONE TIME sale, and NOT repeat customers. How could they be looking for someone to visit their site again if they have to go through SO MUCH trouble to make a purchase. Its ridiculous! Apart from what you have mentioned above, I have visited sites that has up to 12 pop-ups. What are these people thinking? You visit a site and it takes you 30-60 seconds just to exit all the pop-ups. As I said before, I just wish more of the good guys would spent a little more time to show up these culprits who are only causing confusion and frustration in the industry. Just wish I was more successful here and had the clout, I would really spent some time highlighting these flaws. Thanks again for your awesome leadership Charlie. Thanks Charlie. This was a great article and restores my faith there are some ethical good guys out there in the online world if you know what to look for. I’m struggling to get started and have appreciated your articles and newsletter since signing on to your directory. From the eagles nest…..ciao! Good article Charlie. I like the mix of inspiration and tips on how to get where you are going in life. I’m and eagle, and my clients know it. I shared your article on Google+, facebook and twitter. Charlie, your message wae right on time. I hope you don’t mind if I print a copy of it, so when I go shopping I can re-read it for support. I’ve been trying to get a bissines up and running for 2 years now, and I have bought from more turkies than I care to admit. But to sum it up, you have givin me new hope that I’m starting to learn!! thanks Charlie, I’ll check out the book. Obviously you struck a chord with a lot of people and rightly so. I absolutely refuse to purchase anything that has the 3-deep up-sell pages!!! I believe if a person is that desperate than so is their product. Once again, great article … now you can go take a well deserved nap, lol! No wonder, I just realize if there are eagle and turkey in the internet business! So far, too many i find out as you classified as turkeys and very rare an eagle type. Currently, I just run some affiliate program, hope i can evaluate and determine which is belong to eagle and which one is belong to turkey. Or, is there any easy clue to differentiate that such product/service is belong to an eagle type or turkey type? Thank you Charlie for your words of wisdom !!! For my story, I have had to know some turkeys in order to recognize the eagles. The challenge – trust my own gut feelings. Not always easy to do when in a hungry (for money) emotional state. Look forward to the next piece of wisdom…. I also don’t like those marketers that keep sending new offers (often unrelated) after you’ve purchased one of their products. They remain in sales mode instead of building a relationship with their customer. honest,motivated and loving those days. full of zombies with no feelings. there are also sharks everywhere too! Hi Charlie,always your thoughts are to the full true and painful things about IM. I was in situation that you mentioned that with buying all shoddy prodducts.For now I am stopping and trying to see what direction to go. Thank you very much for your golden article.Have a good weekend.Respectful Ioan. I am a sincere believer in “When the student is ready, the teacher will appear.” Seems quite appropriate on this Sunday morning, having read your article. Thank you for the thoughts and advice. Hi Charlie. I just read your Sunday article. It was great. Like many others, I bought all of the no good products that sounded wonderful. Now I am out of money, so very rarely do I buy any products. When I do though, they are solid products that can help me personally. I don’t really know how to do much yet, but I am still learning. I am so glad they have people like you on the internet who really want to help us. Thanks a lot. I follow you a lot. Your family sounds wonderful. Congradulations! May God bless you and your family. Susie Cutshall. I believe the free extends even more than just to a sum of money. When you receive an e-mail with a free offer, there should not be a squeeze page attached either as your mail address is actually a very expensive item. Like you, what also really burns me up is all the up-sells. When you buy something which you think is a reasonable price more often than not you have not actually bought what you are led to believe. To get what was talked about you virtually always need to spend an extra amount, nearly always a rather high amount – it makes me sick! Wish there were more people like you speaking out about some of the practices on the internet. I really think this hits home. I have have been taken in many times. I am not stupid but naive. I always see the best in people. Thank you for sharing this with all of us. I have learned this lesson the hard way. Thanks again. Great article. And then there’s the clickbank and warrior special offer sales pages where you are told what is not in the product and not what is in it. These “blind offers” work on hype only. Thanks for calling out the phrase “ethical bribe” – it is a nasty weasel word! Hey Charlie: You are the best, this is a very good article being a life time member of your DOE I have learn a lot from your articles, you always present good stuffs without selling bunch of garbage, I was a victim of buying buying and buying and never get anywhere but finally discover a company with solid products and good compensation plan,I finally start making money with no stress and no convincing. Thanks for the article, you are the best and honest marketer. keep up the good work and thanks for the encouragement in reminding us that indeed we can soar like eagles. As always, you have really hit the nail on it’s head, again. I am also sick and tired of getting emails with links to sales pages where half the page is filled with screenshots of the Millions of Dollars they have made in 14 days or 7 days, while we all know these are fake and Photoshopped. Why would a multi Millionaire bother to sell me a $97 product at a “One-Time, never to be repeated Special Offer of only $7” ? If that is how he makes his millions, he must hav sold one heck of a lot of these wonderful products/scams. Keep up the good work, at least when you post something, one can read it, take note and belive it. Charlie, whereas you hardly got out of bed in your part of the world, it’s almost time to retire for the night here in Western Australia. 09:40 PM, to be exact. And as I rule I don’t really read mail or post comments at this time o’day, especially on Sundays! But I just want to say thanks for this post of yours. It not only lifted my spirit, but your sentiments are so true..and oh so relevant, especially for the ‘younger’ marketers out there. Well done, Charlie. G’night, mate. Thank you for a wonderful article and a reminder. Yes, the Internet is full of those “Turkeys” who take advantage of people and use their emotions and needs for their own benefits, but there are also the good people “Eagles” who truly care for their readers and customers. Maybe they are not as many, but enough to have a hope that there is good out there. Thank you again and keep up the good work. Right on Charlie!! I am sooo tired of all of the hype and high pressure tactics to sell absolute junk! Thank you for your article. So true, there seems to be quite a plague of turkeys around nowadays. Good reminder. In todays marketing it is all pressure and actors and one push buttone theories. That is all they are Theories. I do not buy unless I can get a positive result from the seller. I also use a work your way up on all my sites. Yes you can upgrade, but that is an option. We supply good quality software and are always open to our members. The personal touch and talking to people like they are NOT idiots is very important to build trust! Even if they yell at you, try to find out the problem. 99.9% are easy to solve. All it takes is patience and understanding. Most members are grateful for a personal response to their problems and also this builds trust. Great stuff once again Charlie! Hope all is well with your family and God Bless! Well as usual, you nailed it, my friend! is a wonderful message and will help others.